The event flyer from the first volume of Brown in the South. Image by Brown in the South. On the eve of Martin Luther King Jr. Day, Southern Foodways Alliance director John T. Edge kicked off the “Brown in the South” benefit dinner at Chai Pani, hosting in front of a sold-out crowd the first in a supper series created by Chai Pani owner Meherwan Irani and Vishwesh Bhatt of Snackbar in Oxford, Mississippi. Beyond serving as a fundraiser for SFA, the dinner was a love letter to Indian chefs living and working in the South. After attending last year’s SFA Symposium, which focused on Latinos in the South, Irani says he began thinking more about his own identity and race and how he fits into the story of the South. The restaurateur, who emigrated from outside of Mumbai, India, says that he felt like an outsider when he opened Chai Pani in Decatur in 2009. As Chai Pani became more popular and well-known in Atlanta’s dining scene, instead of feeling more at home, Irani felt more uncomfortable. 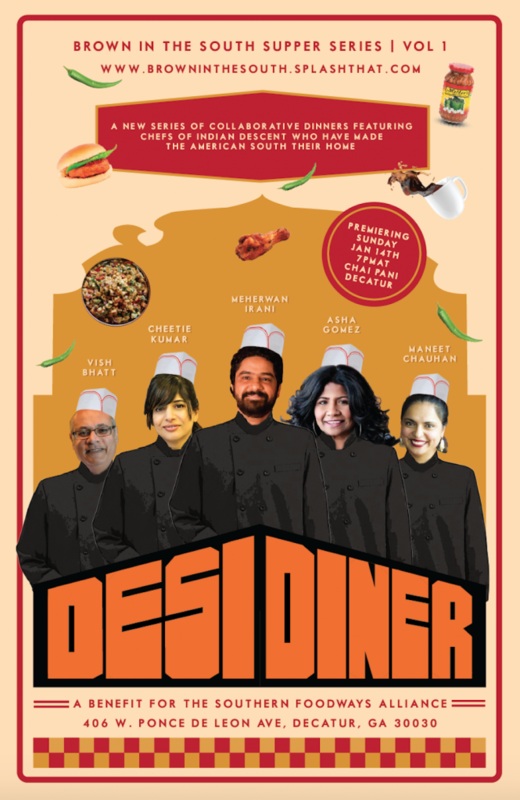 The Brown in the South series was born when Irani and Bhatt set out to find a way to spotlight their fellow Southern Indian chefs. They chose to chose to make the series a benefit for SFA since bringing awareness to all Southern food cultures is an integral part of the culinary organization’s mission. For the first event, the Sunday evening dinner at Chai Pani billed as a “masala meets meat and three,” the duo tapped colleagues Maneet Chauhan (Chopped judge and owner of Nashville’s Chauhan Ale and Masala House and Mantra Artisan Ales), Asha Gomez (chef/owner of the Third Space and cookbook author), and Cheetie Kumar (chef/owner of Garland in Raleigh, North Carolina), all of whom have either won or been nominated for a James Beard award. The meal was a mash-up of South Asian and Southern techniques and flavors. Dishes included Gomez’s Kerala fried chicken, the dish she made iconic at the now-shuttered Cardamom Hill, and Kumar’s fish fritters served with a kaleidoscope of Indian sauces. The camaraderie between the five chefs was obvious to anyone in attendance. Browse through the hashtag on Instagram, and you can see for yourself that the back of the kitchen at Brown in the South looked like a full-on house party. Irani says that’s exactly how it felt. Brown in the South’s next event will tentatively be held in Nashville this August, likely with the same five chefs. The series will return to Atlanta at some point, and Irani hopes to include chefs from other parts of the world such as Central and South America. If you want to keep up with the events, you can follow the #browninthesouth hashtag on Instagram or sign up for notifications to get tickets.